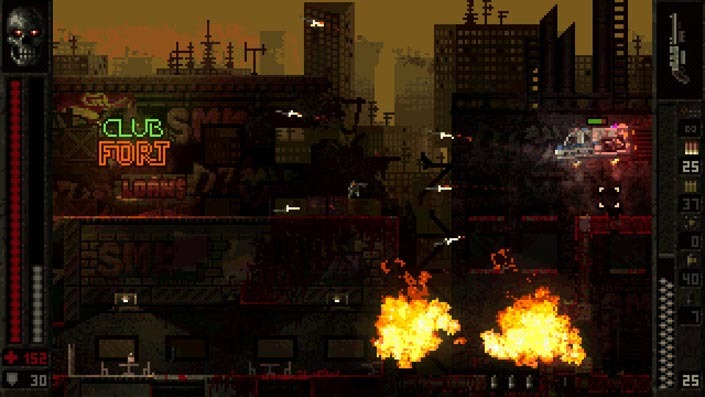 BUTCHER is a brutally violent 2D shooter from developer Transhuman Design. The lovechild of hyper-violent games like Hotline Miami, Doom, and Broforce, it feels like a tribute to the pixelated shooters of the 90's. In fact, it even has a CRT filter in the options menu. It's also the most challenging title I’ve had the chance to review so far, as a writer for OpNoobs. As is stated upon booting it up, “hard” mode is the easiest difficulty. From there, it only gets harder. If you’re squeamish about violence and pixelated gore, you’d best walk away. Not only has BUTCHER got blood by the buckets, it also boasts incredibly unsettling sound effects. Enemies, for example, don’t always die right away; sometimes they’re reduced to a writhing mess of organs and fluids, moaning and suffering from the wrath of your unforgiving hand. Sure, much of that violence can't be expressed visually due to its retro style, but the sounds of an enemy screaming in pain after you’ve run a chainsaw through its flesh, is a disturbing element that more visually advanced competitors wish they could inflict upon on their player base. Plus, the soundtrack is stellar. BUTCHER doesn’t want to pull any punches. And quite frankly, it’s refreshing to play a game that not only embraces violence but manages to build a solid structure around it, without the usual handholding. The game doesn’t explain a whole lot, and there's little time for an intro before it throws you into the action. All you need to know is that you're a dude with a gun (likely the BUTCHER) who's flown his ship into what looks like a derelict space station, and your sole purpose, I guess out of necessity, is wiping out every living being there. You progress through levels and areas spread out over a hub-like world. You jump across gaps, up platforms, all while aiming with the mouse to shoot at enemies. You flip switches to open doors, trigger traps, and call elevators. Level design encourages you to explore, with secret skulls to be collected in every level. There are a few different weapon types, and you’ll always have your trusty (if a little lackluster) chainsaw. Players can also pick up health and armor à la Doom. But be on your toes: the bad guys can come at you from platforms above or take you out from below, and the controls are tight enough that death won't feel cheap. The game does require a certain degree of finesse - you won’t progress otherwise. The graphics work by the way - though the pixels can look muddy, these environments feel alive. Mechanisms move with remarkable fluidity, and the blood effects are impressive. There's so much polish; from its menus to its UI, to its visuals. It's obvious: Transhuman Design was passionate about BUTCHER and the genre it falls into; they’ve created a look that is both an homage to the 90's and one that is entirely their own. The levels and gameplay seem simple at first. Then you die 10 times in a row. A player’s first thought might be to blame the frustrating flimsiness of the protagonist - why is it so easy to die? Then one begins to realize just how many nods this game makes towards Hotline Miami’s brilliantly challenging mission structure. Enemies always spawn in the same places at the same times, and it takes multiple attempts to learn the ins and outs of any given stage. Most players will likely go into it expecting a sort of cathartic experience, blasting at enemies and blowing through levels with ease. They'll soon realize enemies wipe you with a couple shotgun blasts, while jetpack-wearing machine-gunners can appear at any moment. Add the little dudes with swords relentlessly chase after you, killing you before you even have a chance to swear at the screen, and you're set for mayhem - against YOU. And much like Hotline Miami, dying repeatedly within a single level eventually has you blowing your way through it, as the well-oiled and technically adept death-machine you've suffered to become. Every time I perished, I jumped back in, a little wiser to the challenges that awaited me. Then is the tactical approach to weapon-choosing based on contextual need. Hell yeah. That means certain weapons are best for certain situations. The assault rifle is great for far away enemies, while the shotgun can clear out chaotic rooms a little easier. You’ll remember to jump at this moment specifically, you’ll shoot this bad guy first, then leap over the lava, and kill the other bad guy second. You might even not kill few at all, choosing instead to close the door behind you, leaving them for the fire traps that fill each stage. The game had me immeasurably pissed off at how hard it was, and the next moment amused at just how smart BUTCHER can be.